In today’s horse world, if you don’t have multiple slices to your business pie you can’t be sustainable. If you look at all of your streams on income that support your equine assisted business and one of those slices went away, could you stay in business? As a business owner, and yes we have to use the word business, you are more likely to be successful if you have two things: quality services and multiple services. Indiana is known for it’s equine assisted industry and we have a responsibility to stay ahead of the curve and innovate to stay relevant leading the industry. It is this searching for new solutions to old problems that provides centers with the most effective, beneficial programs for their participants. Even the most successful PATH Intl. Premier Accredited Centers and skilled and gifted PATH Certified Professionals have to be aware of relevant trends and new research substantiating those trends that benefit participants. So, what is the answer? Diversify your programs and what better direction to go than toward Equine Facilitated Learning. Diversity. Diversity of programming contributes to financial stability. In the event a center loses funding or a contract is cancelled, it has multiple revenue sources that can support its programs until other work can be secured. All this takes is the same attitude of innovation and creativity to see a new need you can address. Creating and then diversifying an equine-facilitated learning program for your center is an excellent way to maintain a cutting edge in a competitive environment. The beauty of an EFL program is that it can be aimed at a number of different markets: school, corporate, mental health and specialty/target market. Here are some specific tips to get you started. Invest in your education. The best teachers are the best students. It seems as though many people work towards their first certification and many do not go any further. It’s important to have further training in whatever area you plan on specializing. If you want to do team building and experiential education with teens, look at obtaining a certification through E3A, or through Project Adventure. If you are considering coaching for personal growth, look at Wellcoaches or the International Coaching Federation for options. Each specialty will require additional skills that are specific to that purpose. If you are already a registered therapeutic riding instructor, you facilitate a lot of EFL already in your work. However, moving to ground work where the goals are more personal growth in nature, you might still need to look at additional training like the Equine Specialist certification form PATH intl. Many colleagues in the equine assisted industry offer workshops and training to help you to develop and hone your skills. HorseWork Education offers workshops in programming, facilitation and coaching and it’s located right in your backyard in Plainfield Indiana at Strides to Success, considered the think tank of the industry.. Develop your own horsemanship skills. Another great study to add to your education is the addition of Natural Horsemanship techniques. Learning how to speak the language of “horse” has been the greatest joy and the most valuable tools for facilitation in the arena. From the way that we spend time with our horse, the way we halter a horse to the way we lead a horse and all of the different ways that we speak to the horses. When you think about how many hands touch our horses during a week’s time, it is amazing that they are still willing to join up with us humans. The use of natural Horsemanship in the arena with our participants is an excellent methodology for teaching life skills. Natural Horsemanship can also enhance the way we train our volunteers for the benefit of our horses. Learn the art of program design. As we talk about diversifying programming within the realm of EFL, it’s important to discuss how to develop programs. To be successful and to support our industry in general we need to consider the quality of what we are offering, who is going to be our primary audience and why do they need our services. When striking out into a new area, it’s easy to be so excited about the possibility but become overwhelmed without a framework to build it. We use a process called APPLE to build all of our new programs. The process of program development can be best explained by utilizing a step by step process that HorseWork Education (the education component of Strides to Success, Inc.) created called the APPLE Process of Program Development©. This process was created by pulling together the best practices of program development form experiential education, leadership theory and recreational therapy. It involves assessing the community around you to determine the greatest need, planning the outline of your program to meet that need and reaching out to potential partners in the community, preparing the logistics of offering the program and getting the word out, implementing the logistics of the program, and evaluating your outcomes and adjusting the program for the next go round. Partnering with organizations.There are many different directions you can go with EFl and a lot of that depends on what population you want to work with. Let’s look at some different areas, where EFL is a natural fit and where organizations are always looking for new ways to meet the needs of their clientele. TIP! You are more likely to be successful obtaining a grant if you are partnering with another non-profit. Schools.Students that are disengaged from the academic process often do not respond to traditional school approaches. Many of those students have special needs or are at–risk, emotional challenged, gifted or struggling academically with learning disabilities. Some students have other life challenges that they are dealing with that can explain their loss of interest in school. Whatever the reason for the disengagement, PATH centers have a wonderful opportunity to provide the solutions to the schools by helping students meet academic standards, foster character development and gain an excitement about learning. The students learn “by doing” and can receive instant feedback straight from the horses. Corporate HorseWork. In the corporate world, utilizing the APPLE Process of program development might look a little different, but the basic process is the same. One will still focus on the client’s needs and objectives, but you will use a language specific to the corporate world. If you are not familiar with that language it is advisable to find a partner to collaborate with that serves as the expert. The beauty of the equine specialist is that you can have many different partners as you need different expertise. One day your partner maybe a therapist if you are doing EFP, the next day your partner may be a consultant in Leadership and Development and another day may be a teacher from the local school. This is the key to being flexible and attaining the education and the knowledge to dance with many different partners. Often, that is the key to sustainability. Specialty Programming. EFL can provide services to such a wide variety of clients here are some more ideas to stimulate your creative thinking. At-risk youth, school programs, parenting classes, veterans are just a few populations that can be served. These are also populations that can come to the barn during the day when business is the slowest and maximize the use of your facility. EFL is a wonderful compliment to any program. You can use EFL methodologies to custom create programs for specific organizations that may cross your path or custom create programs for a grant opportunity. Many other industries such as healthcare and social services can benefit from the beauty of EFL. Yoga on horseback, offered at OmHorse studio in central Indiana, can be a unique and powerful program but should only be led by instructors trained in yoga and riding. 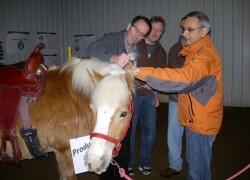 OmHorse offers demos and training in the Equiyo method. Partnering with mental health professionals can be a great way to address the needs of the most challenging of populations. EFL is good for the horses. In addition to developing custom programs for the community, custom EFL programs can also benefit your herd. Many centers have large therapeutic riding programs that require the horses to be ridden for many hours each week. Incorporating EFL can expand into ground activities that simulate play for the horses and can provide a refreshing change. 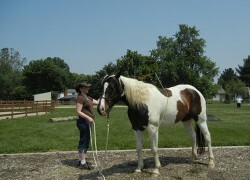 Natural horsemanship can also be incorporated into EFL and that is really a lot of fun for the horses. Incorporating Natural horsemanship into your program can be like getting paid for your horses training sessions! The horses and the instructors can benefit from a week that includes a wide variety of activities. Bringing the horses into the arena to simply play is a refreshing change for them and will add to their effectiveness when being ridden. Including EFL can expand your program without additional wear and tear on the horses. It all boils down to this, EFL can add program dollars to your bottom line and add to your ability to remain a viable and sustainable business. Invest in your education to serve different populations and to fill your tool box with a variety of tools. EFL is a win win for everyone, both horses and humans.